Brewery to try the local beer and food. 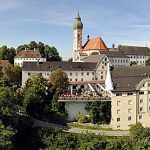 The group will leave the venue by bus at 16:30 hours, and travel to Andechs Kloster. Seating is reserved for the group in the Andechser Bräustüberl from 18:00 hours for an informal meal. The return journey will leave Andechs Kloster at 20:00 hours.